Spring and summer mean it’s all about finding light and delicious salads! 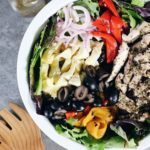 We’ve made so many salads so far this spring, and this mediterranean chicken salad is probably one of our favorites! The flavors, textures and smells take it a notch above the typical salad. We love a recipe that comes together easily and is super tasty! 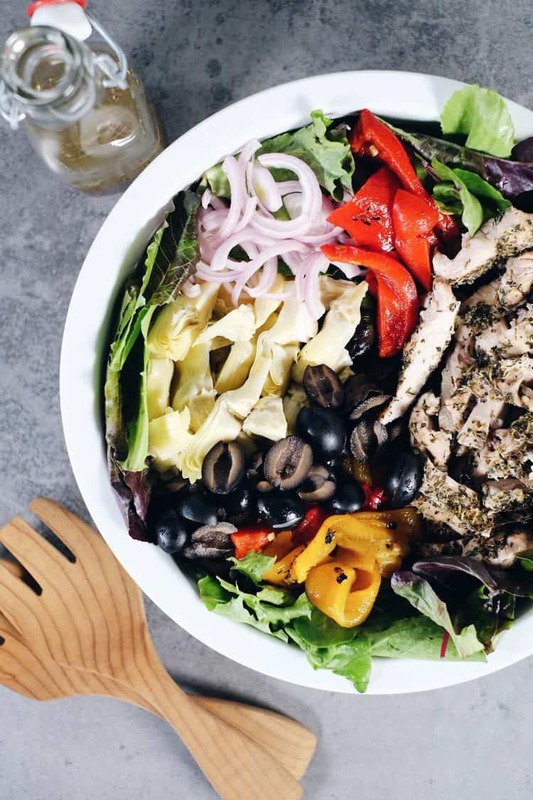 This mediterranean chicken salad pretty much has it all – two kinds of lettuce, red onion, artichoke hearts, roasted peppers, kalamata olives and chicken. Plus the dressing! It’s filled with healthy fats from olive oil paired with red wine vinegar, Italian seasoning and a little garlic. All in all, this salad is rich and crave worthy. In addition to being tasty and downright good, we love how easy this recipe is to make. The only prep work is making the dressing and setting your oven to broil. Once your dressing is made, get your chicken in the oven. While the chicken is cooking, prep the salad ingredients and toss them all in a large mixing bowl. Once the chicken is done, slice it into small pieces and add it to the salad. Toss everything with the dressing, and call it good! You’ll have this one on the table in under 30 minutes. 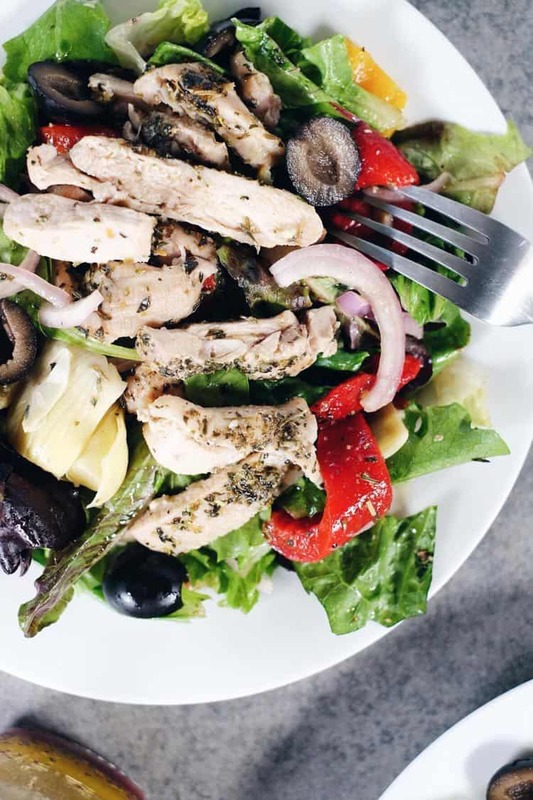 This mediterranean chicken salad is versatile, as it can double for lunch or dinner. You could make it over the weekend and then have it as leftovers for lunch. In this case – just keep the dressing separate, and add it right before you enjoy lunch. It is also great for an easy weeknight meal, since it can be made in less than 30 minutes. You decide! 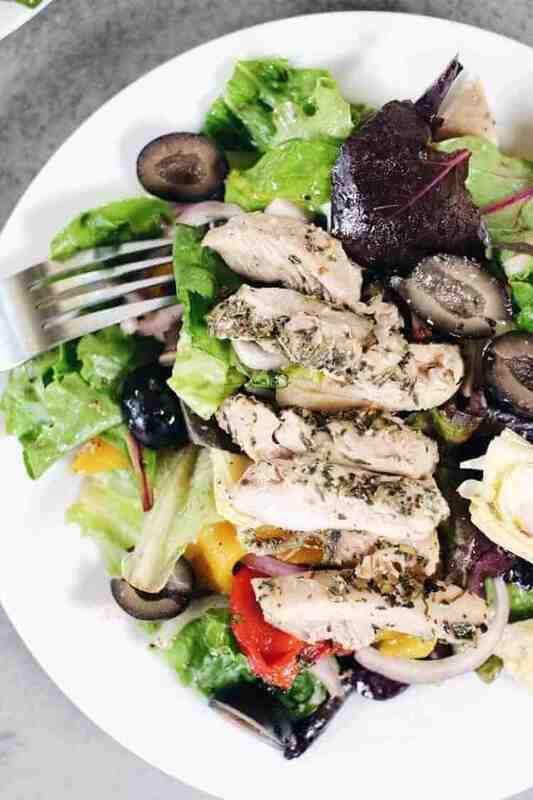 We’ve got some other yummy salads you might like as well! Check out our recipes for our Chopped Thai Shrimp Salad, Chili Lime Chicken Salad, Apple Walnut Spinach Salad and Simple Steak Salad. 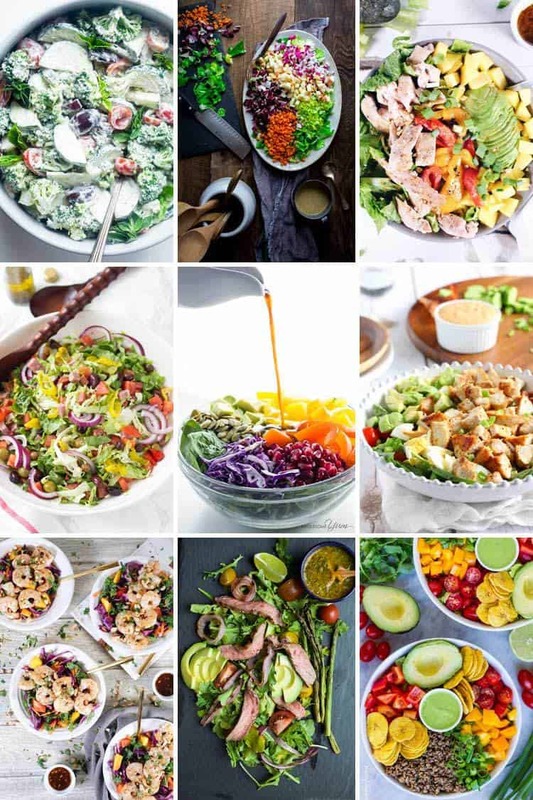 Also, check out our post about How To Build The Perfect Salad and get links to the recipes for all the beautiful salads in the collage below. 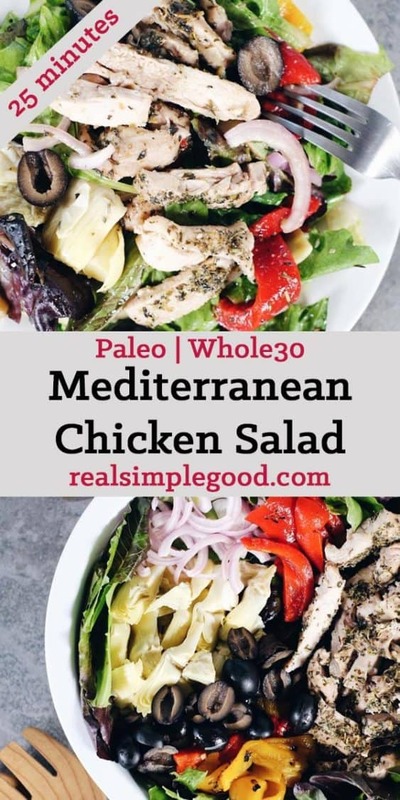 Go ahead and add this mediterranean chicken salad to your rotation! It is robust in flavor, yet still light and refreshing for the spring and summer months. Let us know how it goes by leaving a comment below. Also, take a photo and tag us on Instagram @realsimplegood, so we can check it out! 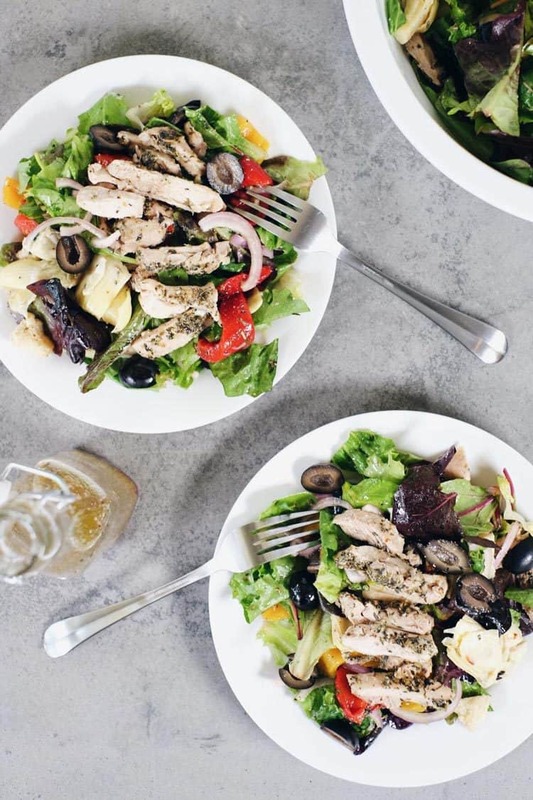 This quick and easy mediterranean chicken salad is the perfect light meal for spring and summer. Set oven to broil, and make dressing by combining the dressing ingredients in a bowl or jar with a whisk. Grease a baking pan with oil and place chicken in the pan. Season with about 1 tbsp Italian Seasoning on each side. Place chicken in the oven to broil for 6 minutes. Remove from oven and flip chicken over and return to oven to broil for another 6 minutes, or until chicken is cooked through. Remove from oven and set aside. While chicken is cooking, cut up the lettuce, onion, olives and artichoke hearts as noted and place in a large bowl. Add roasted peppers and toss to combine. Cut up chicken into bite sized pieces and add to the bowl. Toss salad with dressing, top with parmesan cheese if desired and serve immediately.